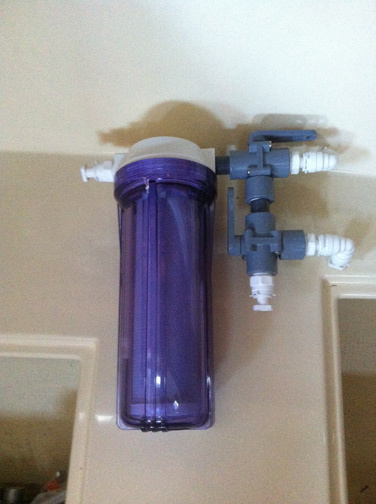 Watermaker – July 2013 - Mar 2014. Watermaker – To buy a watermaker (WM) or not, that was the question. Had I planned on sailing the Atlantic I think I would have gone without a WM, but Mexico and some of the Pacific Islands do not have an abundance of water. I realize that many people do sail the Pacific and Mexico without a WM and it is far from essential. However, I don’t want to make our cruising destination decisions based on water availability. Besides the Admiral will do without a lot of stuff on the boat, but the one thing she wanted was the ability to take regular showers. Enough said. For those unfamiliar, a WM turns salty ocean water into drinkable fresh water. In a nutshell, a WM takes in seawater and pumps it at high pressure through a really small micron filter element, small enough that the salt crystals in the water cannot pass. This left over salt is then pumped overboard back into the ocean and the pure freshwater (as good or better than bottled water) is pumped into our water tanks. The choices are many when it comes to WMs, and everything is a tradeoff. I ruled out the really small DC WMs that produce a couple of gals/hr. I didn’t want to hear the thing running all of the time. 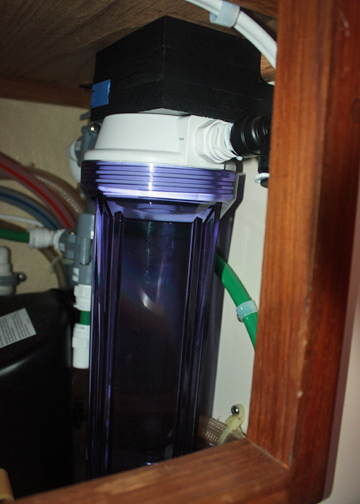 Besides, I kept seeing that a freshwater back flush will greatly increase the longevity of your filters, which takes 3-5 gals to do it right. Trickle filling your tanks doesn’t seem very efficient. One cruiser favorite is the Spectra DC WMs which boast the best amp/gal production. It is pretty compact and well known. It also seems to be the most popular cruising WM with a high satisfaction rating. Most importantly, it is easy on the battery bank. However, I read a few blogs where people had to rebuild the Clark pump (which is the technology that makes the WM so efficient) in far off places. I debated with myself for months but decided that I didn’t want to deal with specialty parts. So I started looking at simple, off-the-shelf part WMs. The next decision I next struggled with was DC or AC. o If timed correctly the solar panels/wind gen could keep up with production without draining the batteries. After much angst and indecision, I decided on an AC system. Two things tipped the scales for me. First, 30 gals/hr verses 8. I have a 75 gal capacity on Indigo. With the AC system I can fill the tanks in 2.5 hours, or 7.5 hours with a DC system. Even if I don’t fill my tank every time I use it I can run the AC WM for 15 min and get the same production as a DC WM after an hour. Second, I came to the conclusion that the WM is not a necessity. It really is a nice to have, not a need to have. Therefore, I reasoned, that while it would be nice to be able to run it via the solar panels, it wouldn’t be necessary. I also realized that the AC system will run off of a 2000 watt inverter if necessary. That would let me run the WM with the engine running and mostly keep up with the energy required. In a pinch, I could run the WM for a short time off of the batteries and not run them down too much (again I could make the same amount of water in 5 min that a PUR 40 makes in an hour). I thought about building my own, but after looking at the ever lengthening To Do list and diminishing time line, I decided on buying a complete and tested unit. After a lot of research I settled on and purchased a 30 gal/hr Cruise RO Watermaker. They have excellent customer support and enjoy a great reputation from those that use their system. What really sold me though was the lack of proprietary parts and the simple and robust design. Now the hard part. Where to put all this stuff? The twin filter module used on the RO 30 is huge and I struggled with the placement. Originally I was going to install them in the cockpit locker but then I realized that I had some mostly wasted space behind the port settee. Due to the space's odd thin shape conforming with the hull it was not really useful for storing much. 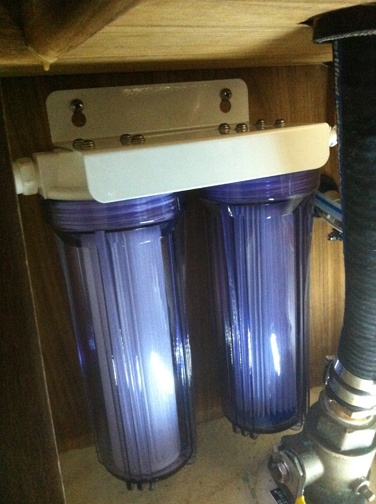 But I realized that the filter module would hang underneath the shelf if I mounted it on brackets. After making some cardboard templates, I took it back to the shop and fabricated some beefy brackets out of 3/16 by 2 inch stainless steel bar stock that will have no problem supporting the weight of the water filled filter module. Fortunately, the RO WM is completely modular which allows me to stuff the components where I can. Since I do not want to drill more holes in the bottom of the boat, I reused the old head water intake seacock (see composting head page). I struggled for awhile on the motor placement. 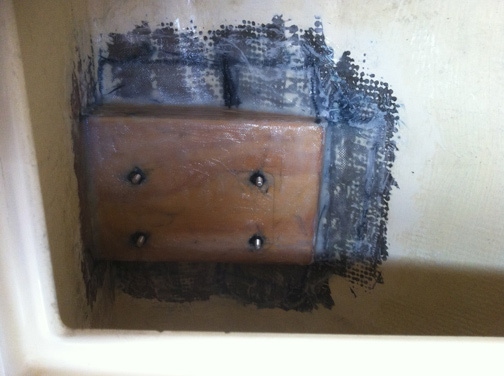 Originally, I had decided to install it above the batteries on the shelf where the water heater used to be installed. 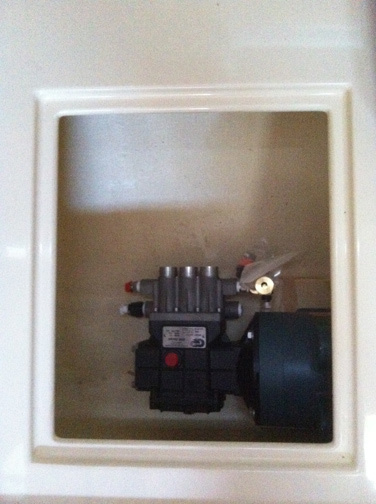 I didn't like the idea of putting the pump above the batteries and having the corrosive fumes slowly corrode the pump. 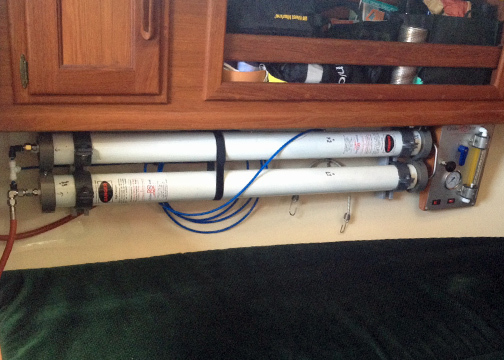 I also didn't want to put another 50 lbs up high on the port side of the boat. Lastly, I would have to run hoses back and forth all over the boat. As much as it pained me to reduce locker storage, it was clear that installing it under the port settee was the best answer. It kept the weight low, below the water line, was closer to all the other components reducing the hose run lengths and complexity, and was easy to service. The first step was to make a platform for the pump and motor. I made a cardboard template and then glued up a block of wood using 3/4" plywood, drilled holes for the mounting bolts and fiberglassed it to the hull. I cut some thin sheet rubber mat to bolt between the motor and hull to hopefully dampen vibration and then bolted it down. 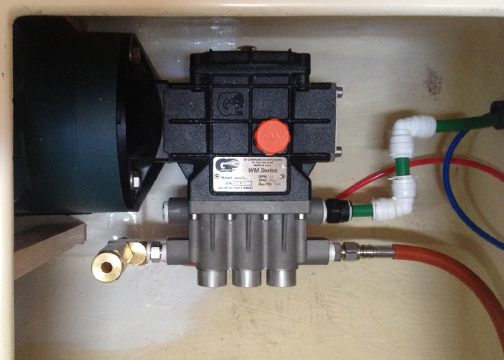 The next step was to install the pre-filters and 12 volt feed pump. The only good place I could find to mount these items was under the kitchen sink which worked pretty well. It had just enough room to mount everything and was close to the water tank selection valves to splice the water maker output hose into. Installation was pretty straight forward but not easy due to the space limitations. I then struggled with where to put the WM control panel. I wanted to install it somewhere in the vicinity of the sink. I thought about the back side of the sink - too big of a hole to cut in the fiberglass and would be easily bumped and broken. Inside the little spice rack cabinet on the side of the sink - protected and easy to get to, but took away storage and the cubby inset would not be easily disassembled. 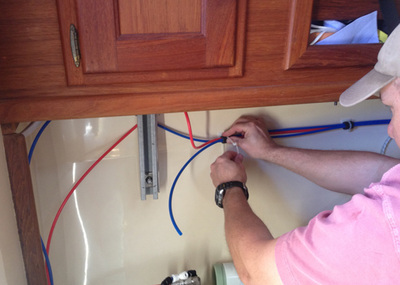 Inside and under the sink - a huge pain to use, and not easy to install the lines and fittings. Finally, I decided on installing it just forward of the WM filter modules and behind the settee - took up wasted space and was easy to get to, but I had to make a wood mounting bracket. Lastly, I ran the hose runs and electrical connections. 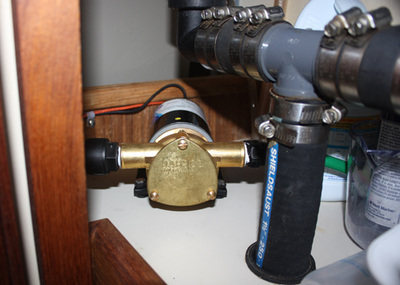 I installed a small sea strainer next to the intake seacock and ran the incoming seawater line under the floor back to the sink where it is connected to the feed pump, filter assembly and then to the high pressure pump. The brine discharge hose was spliced into the ships bilge pump discharge hose using some bronze fittings. I chose to splice into the old hot water heater A/C wiring, which had appropriate sized wire and circuit breaker. 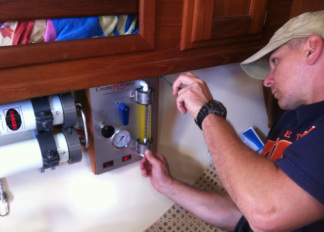 When in use, I plug the generator or shore power into the boat's main power receptacle, turn on the appropriate A/C circuit breaker on the panel and then turn on the motor at the WM panel. Overall, this project took longer than expected, but mostly because I spent a lot of time changing my mind about the installation locations. And more time to fabricate the custom mountings I needed for the motor, tubes and panel. Other than the motor and pump module it doesn't take up a lot of usable real estate and I'm glad that it is completely out of sight when not using it. Also, access is very easy for routine maintenance. Installing large things in tiny places. Typical. 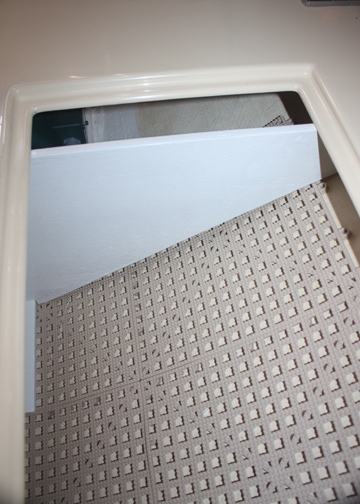 Carbon filter under the sink, starboard side, used for back flushing the membranes. 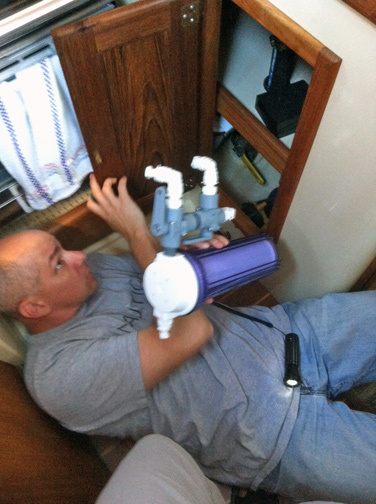 Pre-filter installed under sink, lower port side. Sea water goes through this before going to the membranes. 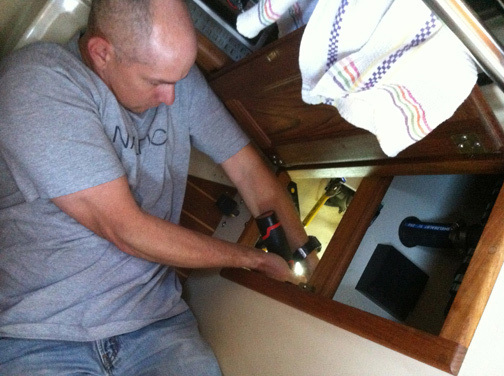 Installing large items in small spaces in the dark. Even better. Motor base from the side. Motor as viewed from the aft settee access. Motor under the port settee. Before epoxying. Base epoxied into the hull. After this it was painted white. Pump is finally mounted to base and wired. Wood divider 6" from pump. Allows ventilation and keeps storage items from shifting near it while sailing. 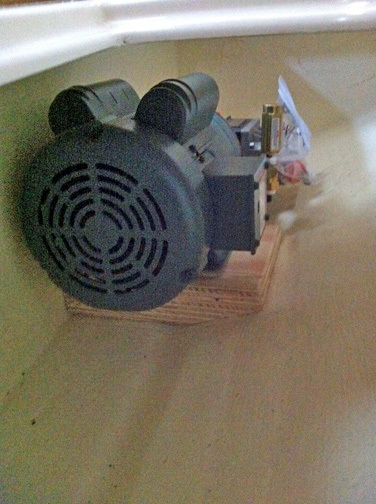 12V booster pump. On shelf under sink to port. Tidying up hoses behind the filters. Heavy duty hose pieces around the plastic hoses and between zip ties. We hope this helps keep chafe down. Voila. 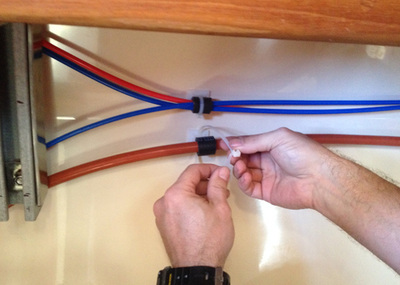 The blue hose is the tester hose, which easily runs to the sink for testing before we switch the flow to the tank.